In hindsight, I wish that I was, oh let's say, something like 15 years younger. That would put me in my early 20s and just out of college. And, let's say that I went to a Boston-area school. I would probably look for a job in the region and settle there for a while. 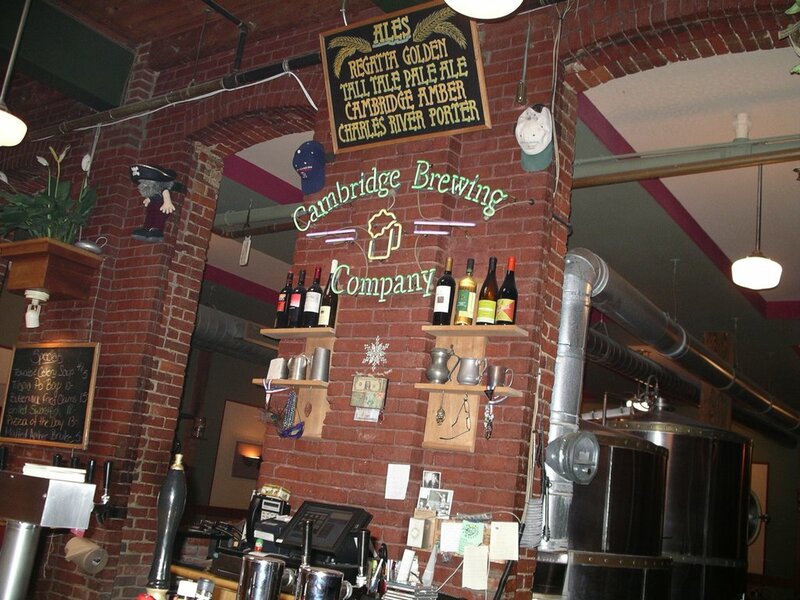 And, I would have one of the area's best kept beer secrets at my easy access....Cambridge Brewing Company. OK, so let's stop living in the past. Actually, I live in the Philadelphia area and only get to Boston every so often. But, I swear to you that everytime I do from now on, I will stop at nothing to return to CBC. When I was planning my trip to Boston, I happened to be at Iron Hill in West Chester, PA and talking to Chris LaPierre. Chris was a former brewer at Harpoon in Boston, met Will Meyers in Philadelphia, and subsequently moved to Philadelphia to work at Iron Hill. In the meantime, Will went to Boston to help out with CBC. Do you care about any of this? Perhaps not....but hang in there. 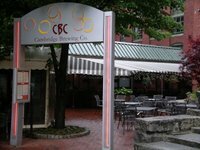 I told Chris that CBC was on my list of places to try in Boston. He said "change that...put it on your short list, Will Meyers is doing some great stuff at CBC. He and I are friends and I really think you should check it out." (or something to that effect) So, what did I do....you shouldn't have to ask! 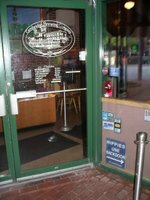 I have written in other reviews about taking the MBTA's Red Line to Somerville for places like RedBones and to Harvard for places like the original John Harvard's. Just two stops closer to downtown Boston and at the last stop before heading across the Charles River is the M.I.T./Kendall Square stop. Get off there, walk approximately 4 blocks, and you will arrive at Cambridge Brewing Co. At first, it is hard to know what to make of the place. The location is set back off of Hampshire street. Then, as you approach the tucked-away building, you only see some windows and outdoor seating...nothing too indicative of what you will find inside. 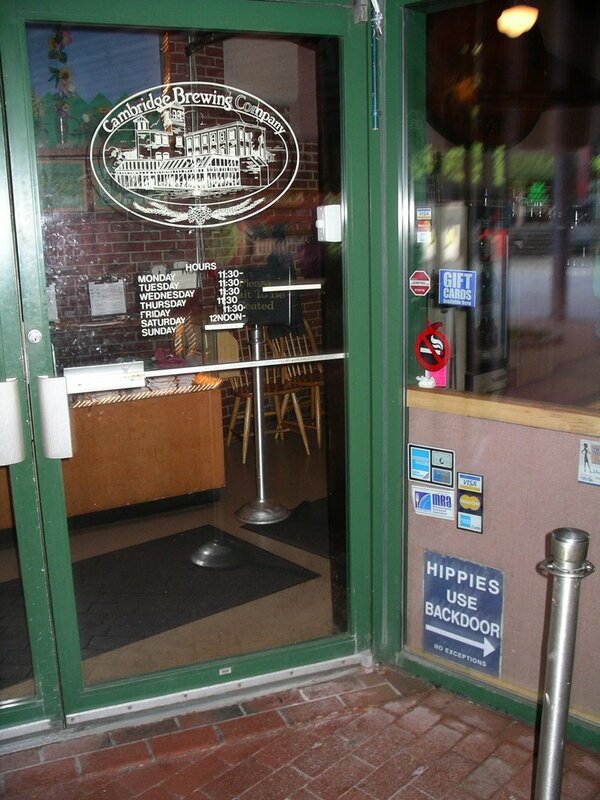 And, even when you walk through the front door, the layout of the establishment is not extremely unique or memorable. Some tables are situated in the front of the house and an equal amount in the back. In between is the main bar with no more than 20 seats around it. Now, don't get me wrong, the place is spacious enough, but it is not huge. Though, I wonder what the place (including the outside courtyard) looks like during a busy night, a promotion, or a festival. In any case, on this particular Sunday afternoon, we were able to easily sidle up to the bar for some light snacks and tasty beers. 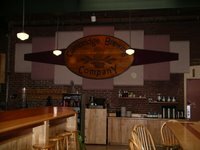 What originally was planned as a one, or maybe two, beer stop quickly turned into sample tastings and three glasses of various brews that they had on tap. Making it easier to stay was our bartender, Tracy, who made us feel comfortable, was more than happy to serve up samples, and cheerfully chatted us up with information about the place and its history. Unfortunately, Will had just earlier left for the day. However, he would probably be there on Tuesday night, she said. Hm, coincidentally Tuesday night is when they setup their weekly cask conditioned feature. What should I do?.....once again, you shouldn't have to ask....hm, silly question! I will get to the cask-conditioned Tuesday night in tomorrow's post. While Patty and I visited on Sunday, we either sampled or had whole glasses of each of their varieties on draft. We basically agreed on the ordering of our favorite of these brews. They each stood out for their own individual reasons and I surely would not kick any of them out of the barroom. 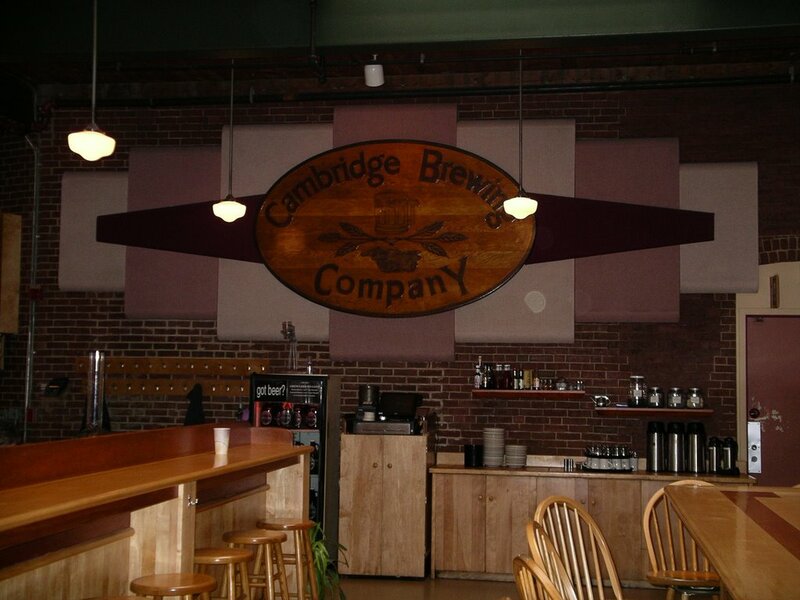 But, we were both extremely happy with the Golden Ring Abbey, Charles River Porter, and the Cambridge Amber. 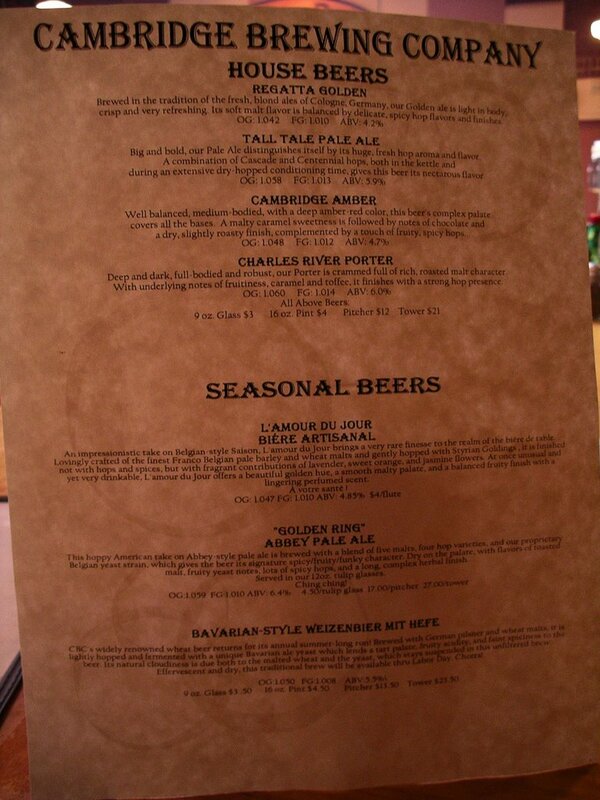 The other easily quaffed beers included the L'amour du Jour, Hefeweizen, Tall Tale Pale Ale, and the Regatta Golden. Fortunately, growlers to go are readily available! 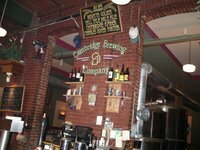 Click here for my follow-up visit (just two days later) to Cambridge Brewing Co. I do love both the atmosphere and beers at CBC... in the fall they have one of the better pumpkin beers that I've had. Some interesting menu items as well. I do have to add, however, that if you were like most people 15 years younger than yourself, you wouldn't really like this place. Frankly, it is kind of lame. I've been a number of times, both during the week and on the weekend, and the scene is always kind of dead. It's a shame too -- this place and its sister bar Tommy Doyle's should be hopping every single night, especially right next to a university (MIT)... but it never is. (The only exception being during a Red Sox - Yankees playoff game). That being said, worth a stop if you are in the area. I'm in Boston for 24 hours and hope that I have just a spare 60 minutes or so today before I leave for the airport. I'd like to head up there and see what's on tap this week. Remember, I said I'd stop at nothing to return....we'll see!